Two leafminers are most prevalent. 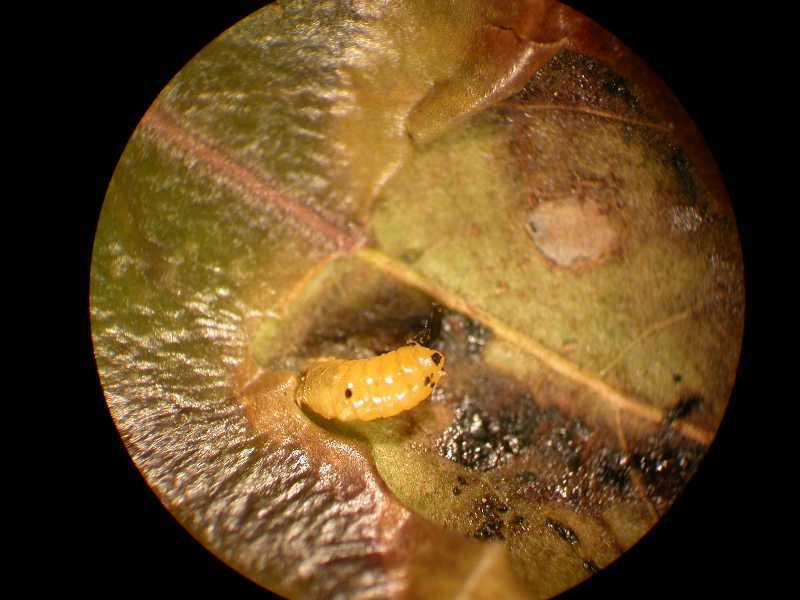 The native holly leafminer, Phytomyza ilicicola, is a common pest of American holly. 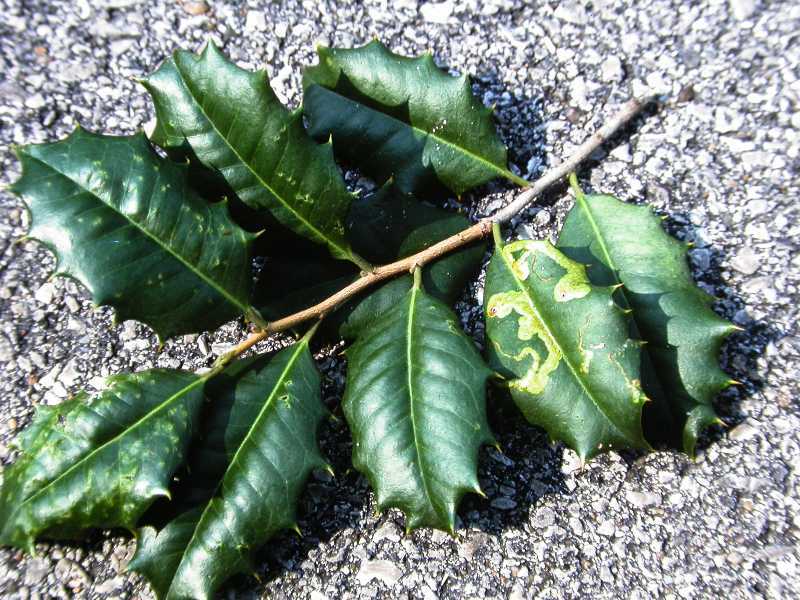 The holly leafminer, P. ilicis, feeds only on English hollies. The adult of both is a small black fly only about 1/8 inch long; the larva, a maggot, tunnels in the leaves causing yellowish or brown winding trails or blotches. Leaves may also become distorted and flecked with tiny brown dots. Leaves eventually yellow and drop. This should not be confused with the natural yellowing and shedding of older leaves which occurs annually in late spring or when the plant is under stress. 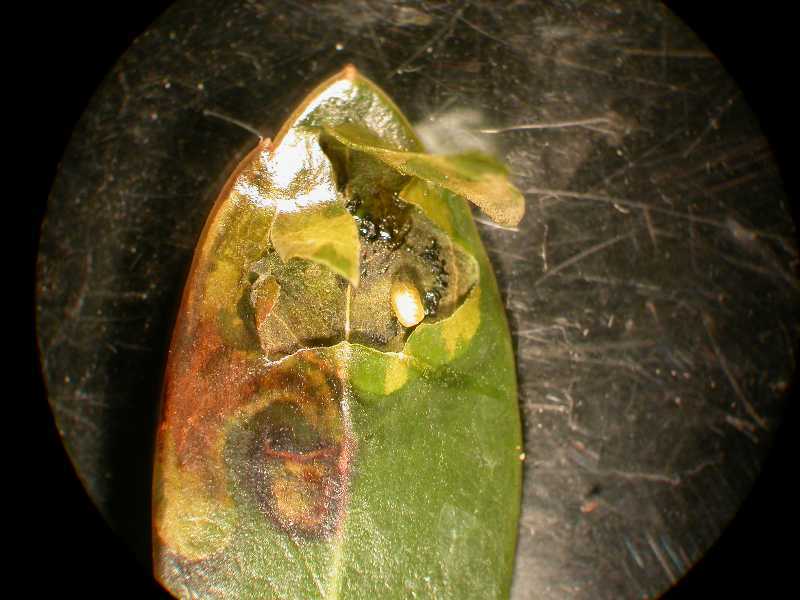 Early signs are small raised bumps on the leaf where the egg has been inserted in the leaf by the female. The females also make small pinpoint holes in the leaves, called feeding punctures, through which they and adult males feed on the tender juice inside the leaf. This damage may be confused with damage caused by leaf spines, which can also cause punctures in leaves. When the young maggots hatch from the eggs, their feeding results in light green serpentine tunnels that become progressively wider as the maggot grows. In later stages, the maggot may have mined an area that looks like a spot or blotch. 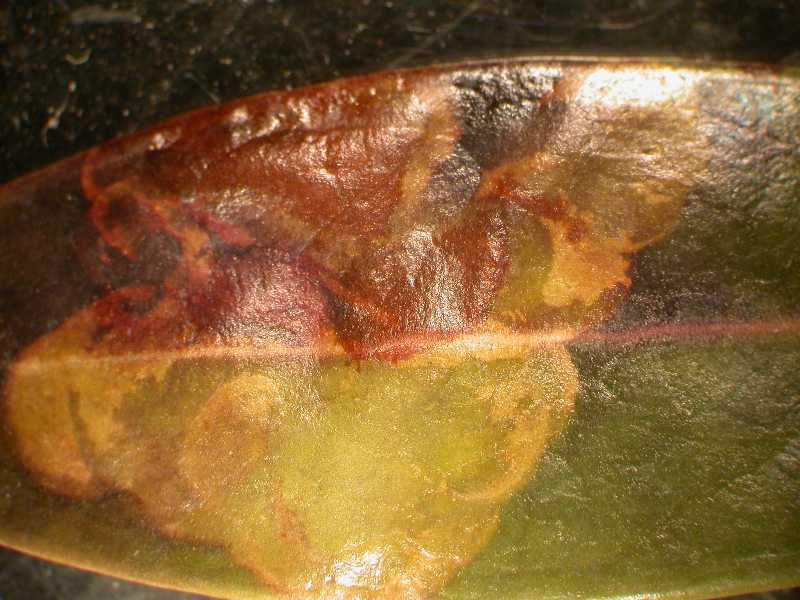 When scraped with a knife or pin, the upper leaf tissue will peel off revealing a mined area below. The maggot or frass (insect droppings) may be evident. In later stages, the leaves yellow and drop. Examining the leaves for tunnels will confirm the presence of leaf miner. Only one generation occurs each year. The larvae overwinter in the leaves on the tree or leaves which have fallen. Adults emerge in mid-May to late June and begin laying eggs in about 10 days. The females make a slit in the leaf and deposit an egg inside the leaf. The larva hatches and the young begin feeding on the leaf tissue. 1. Pick up and destroy infested leaves. If damage is noticed after mid-May, most insecticidal sprays will not control the pest. To limit future infestations or control a minor problem, collect and dispose of the infested leaves on the ground and on the tree in fall or winter. Do not compost the leaves. For minor problems, limit the use of insecticidal sprays used on the plants or in the area, which could kill beneficial insects, such as the small beneficial wasps that parasitize leafminer maggots. 2. Keep plants healthy. A healthy plant is better able to withstand occasional defoliation caused by leaf miners. Water during dry periods and mulch to help retain moisture. 3. Crush the small eggs or tunneling miners. Inspect small plants for early signs of damage and squeeze the eggs or young maggots. 4. If necessary, use insecticidal sprays. For severe cases, spray the new young foliage with an insecticide beginning in mid-May when the adults begin to emerge and lay eggs. Usually two follow-up sprays 7-10 days apart are needed. Check pesticide labels for directions and be sure to spray both the upper and lower sides of the leaf well. Insecticides include acephate (Orthene), spinosad and imidacloprid (Merit). Imidacloprid may also be applied to the soil in early spring. Strategies 1, 2, and 3 are strictly organic approaches. For an organic approach to Strategy 4, consult the Organic Materials Review Institute (OMRI™) for appropriate spinosad products.